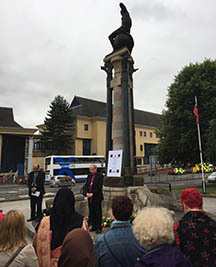 At very short notice, an interfaith Peace Vigil was held on Thursday evening at the memorial off Commercial Road in Newport. There were representatives from the Muslim community as well as the Church in Wales. Three hundred and fifty roses were laid at the memorial signifying the victims of the recent terrorist attacks. Over 60 men, women and children, were present. The roses have now been taken to the Cathedral and an area of prayer has been arranged.